Vaileth and Susana, aged 4 and 5, live with their grandmother, Fausta, and another young cousin in a small mud house in Tanzania. Fausta first noticed that something was wrong with both her granddaughters' eyes when Susana was only a few months old. Vaileth and Susana’s sight problems started affecting their everyday life. Then Fausta heard that CBM’s partner hospital was running free eye screenings to identify people with sight problems. Vaileth and Susana were losing their sight to cataracts, which causes the lens of the eye to become cloudy. 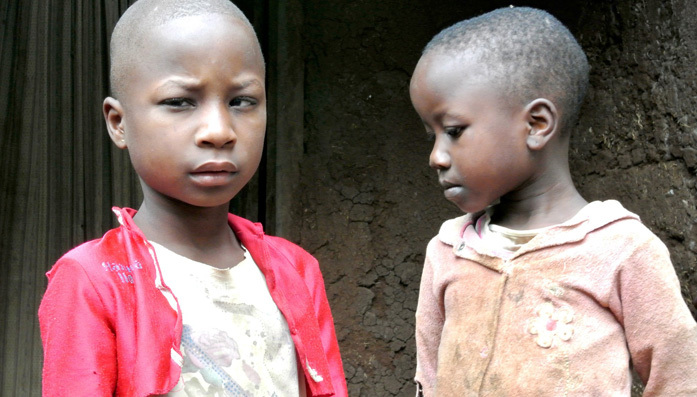 They were both born with the condition and their sight was slowly deteriorating. Doctors don’t know why both girls have the condition – it is possible it is inherited, or could be linked to environmental conditions. But without treatment in time, they would both become permanently blind. The hospital arranged for transport for Fausta and the two girls to hospital for cataract surgery, under general anaesthetic. The surgery and transport is funded by CBM supporters, as the family have no money to spare. “I will be happy when the children have had their surgery”, says Fausta. “They will be able to see, rather than have to feel their way around." Vaileth and Susana’s surgery went well and Fausta was hopeful for the future. A few months later, we visited the family at their home to check on their progress. Both girls need glasses and have been for follow up appointments funded by CBM supporters, but Fausta is delighted that they can now help her at home and find school much easier.